Long after New York City is gone—perhaps reclaimed by nature per The World Without Us—I'm certain we've created a record that should survive long and well enough to offer glimpses into life in New York City. 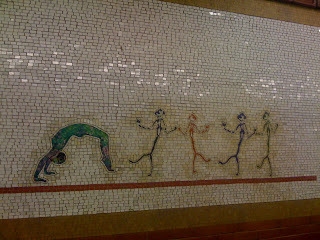 I'm talking, of course, about the tiled mosaics that litter the subway system: some show landmarks and cultural scenes concerning the locality above, and others depict daily life. All together, they provide a glimpse into life in this city. 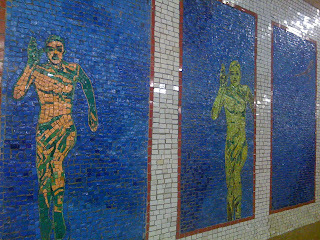 The subway mosaics that so many of us pass on a daily basis are reminiscent of the early artworks that were commissioned to beautify the system in the early 1900s. Architects Heins & LaFarge were tasked with creating signs and plaques that would tell customers where they were while capturing essential elements from the neighborhoods above. And though they would be replaced as architects with the more minimalist vision of Squire J Vickers, some of their original stations have survived and have been updated to preserve the Beaux-Arts element of the city's definition. There's something about the mosaics that warm the subway for me—it feels safer, brighter, and in depicting the familiar, the mosaics help me feel as though this is home. It's a sense of knowing a place via these images as opposed to merely finding them pretty decorative elements. 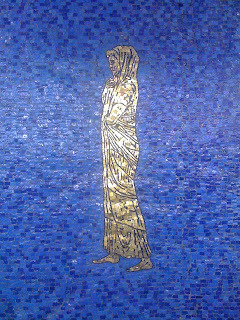 Lincoln Center didn't exist until the 1960s, so this type of imagery wasn't a part of the original 1904 station. However, its inclusion in the renovation reminds us of our changing social landscape, and leaves a neat record for the future. For example, the mural at 23rd Street may be a nod to a notoriously windy corner of the city while paying tribute to some of the local celebrities. Though the City Dwellers series at 28th Street may require a bit more creative brainstorming. In both instances, the result is a very human effect—a small mark indicating who we were for this present. What are your favorite subway mosaics—both here and abroad? I'm sure you pass a few ever day.